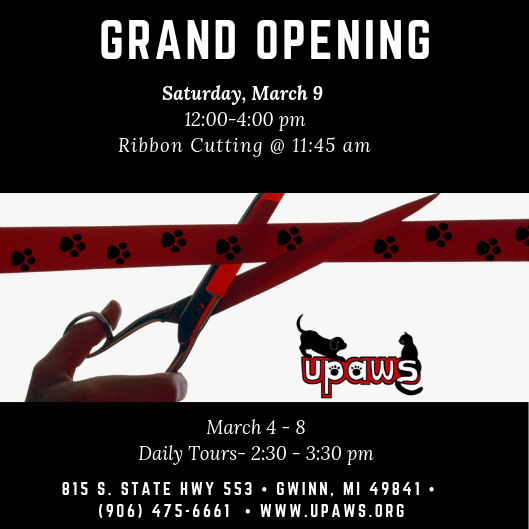 Please join us for the Upper Peninsula Animal Welfare Shelter’s Grand Opening Ceremony for the new animal shelter on Saturday, March 9th from Noon to 4 PM located at 815 South State Highway M553, Gwinn, MI. The ribbon cutting will be held at 11:45 AM. Your support in this journey has made the new UPAWS campus facility a reality. Our future is even brighter with the opening of the new state-of-the-art campus with features making a healthier, happier environment for the animals in our community that need forever homes.